My girlfriend is always ranting and raving about how cute and adorable her wee dog is. So I thought that I would turn him into the least cute thing I could think of, which is a Nazi . . . I’m not a racist, by the way. I just really really wanted to piss her off. In a country run by rational adults, this would have been dismissed as a tasteless but harmless joke. But in twenty-first century Britain, it is a crime. The judge, apparently persuaded by the prosecution’s implausible claim that the video is Nazi propaganda, found Meechan guilty of sending a grossly offensive communication. Sentence will be passed in April but, given the court’s disdain for common sense thus far, we can probably expect the punishment to be severe: jail time and/or a hefty fine, supported by a vindictive and unnecessary battery of restrictions on using the internet, owning dogs, living within 400 miles of a synagogue, and anything else the court can find to throw at him in the interests of making an example. Justifications for the verdict have stretched from the disingenuous to the absurd. Secure in the knowledge that he knows Meechan’s mind better than Meechan himself, the judge rejected the defence’s argument that the video was intended as a joke, and ruled that it was “aggravated by religious prejudice.” The Scottish Council of Jewish Communities (SCoJeC), one of the main witnesses for the prosecution, released a statement in support of the outcome, highlighting the amount of online abuse they had received throughout the process. To subject anyone involved in a court case to an anonymous mobbing is obviously indefensible, and an insult to the principles of civilised justice. However, this harassment was not the result of Meechan’s video, but of SCoJeC’s public association with his subsequent prosecution, so their argument is circular and nonsensical: an objectionable popular reaction to an objectionable act of censorship somehow proves that the censorship was necessary in the first place. The reaction on social media has been largely predictable. Free speech absolutists and a (dismayingly) small number of comedians have condemned the verdict, while the social justice crowd has applauded the state for punishing a dangerous criminal. Double standards have not passed unnoticed. It is apparently acceptable to call for violence against white people, men, and ‘TERFs,’ and even to wave the Islamic State flag outside parliament, but the slightest connection to Hitler, regardless of intent or context, is enough to trigger a moral panic. 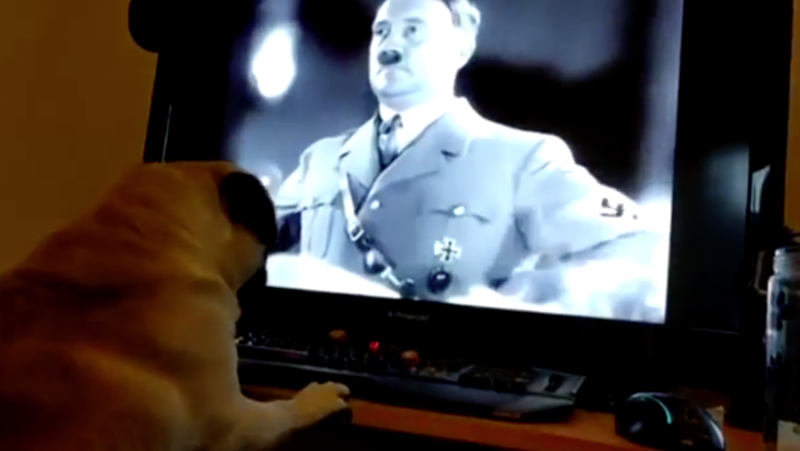 Exactly how a dog video is supposed to encourage anyone to do anything, let alone start murdering Jews, is beyond me. The authorities seem to have embraced a magical theory of history in which the rise of Nazism did not result from complex social and political factors in the aftermath of the First World War, but from some sort of contagion spread by poor taste. Section 127 of the Communications Act effectively codifies a regime of censorship that only applies online. Stand-up comedians can lawfully joke about the abduction of children onstage, but if anyone does the same on Facebook they could be looking at a three month jail sentence. The law makes it illegal to use a public communications network to send “grossly offensive” messages — a vague and subjective descriptor, the meaning of which depends entirely on the whims of the court. It doesn’t matter whether the message was public, private, or never seen by anyone at all. It doesn’t matter whether offence was intended or taken. It doesn’t matter that there is no practical way to determine what is grossly offensive until after the accused has been convicted. This is an online blasphemy law by another name, only worse; at least the generally understood parameters of ‘blasphemy’ make it possible to foresee what will get a person into trouble. With woolly and ever-expanding concepts like ‘offensiveness,’ it’s anyone’s guess. Unsurprisingly, this poorly drafted law has been a disaster. Its usage — along with that of its older sibling, the Malicious Communications Act 1988 — has increased rapidly over the past decade, with convictions reaching well over a thousand per year. These alarming statistics eventually prompted the Director of Public Prosecutions, Sir Keir Starmer, to issue new guidelines intended to reduce the number of frivolous prosecutions and the undesirable chilling of free speech. This new guidance was not enough to save Dankula. Once buzzwords like “hate speech” are invoked, the need for the state to ‘send a message’ overrides any competing questions of public interest. More recently, the government decided that the maximum possible sentence for sending malicious communications should increase from six months to two years, apparently to disincentivise those tweeting abuse at celebrities. Don’t expect this situation to improve any time soon. The crackdown looks like it is just getting started. “Hate speech” has become the reliable battle-cry of the modern-day censor, but it is a largely meaningless concept. Ask 10 people what it means and you will probably get 20 different definitions. There is little evidence to suggest that insulting someone’s race or religion causes more harm than insulting their height, weight, hair colour, intelligence, popularity, or any number of other attributes. So far, the solution to this conundrum has involved the addition of more and more protected characteristics to the list, depending on which campaign group shouts loudest, rather than addressing the question of why such a list needs to exist in the first place. In the case of Dankula, of course, there wasn’t a victim at all. The video was not an attack on the Jewish community, it was a joke posted for the amusement of a self-selecting YouTube audience. People had to decide to watch it before they could get offended. The Dankula case is only the latest example of government anxiety about the alleged dangers of free speech. Earlier in March, we saw the expulsion of three prominent right-wing activists on the grounds that their presence would not be “conducive to the public good.” Although the cases are not directly related, they both demonstrate the same paternalistic attitude – ordinary people need to be protected from their own gullibility and vulnerability to manipulation lest they start setting up concentration camps. Besides which, as the recent case of the Parsons Green bomber demonstrates, immigration officials seem to be selective about what they consider to be conducive to the public good. Conservative YouTubers are sent home on the next plane while asylum applicants who admit to jihadist sympathies get a referral to a government counselling programme. Many will no doubt argue that the likes of Markus Meechan are untalented attention-seekers with nothing of value to say. Be that as it may, it is entirely beside the point. The ability to speak freely – especially if that speech is obnoxious – is the fundamental bedrock of a liberal and democratic society. It is not an arbitrary privilege granted to those the authorities deem worthy. The dismal spectacle of a man flanked by police officers and escorted from his house in handcuffs for making a joke should awaken those who complacently insist that the right to free speech requires ideological limits imposed by the state. Perhaps this case will finally provide the impetus we need to turn away from the kind of misguided and paranoid thought-policing which — unlike a sieg-heiling pug — actually could lead to a nasty far-right backlash. My only problem with your article is that it makes it sound like the dog was simply trained to raise its hand. Whilst the individual in question was repeating over and over *do you want to gas the Jews? Not exactly a subtle Heil Hitler is it? Where as I’m all for freedom of speech and humor no matter how dark and insensitive I do believe it’s disingenuous to leave out detail. Don’t worry, the dog did not understand the question it was saluting to. Dankula has very poor taste to say the least – gasing people is no joke anyway you look at it. But, there’s no law against poor humour and neither should there be one. Whatever the question to the pug the fact remains that “hate speech” laws are a bigger threat to our democracy and way of life than the “hateful” words themselves. Doesn’t matter. He was talking to his dog. His dog doesn’t understand what is being said, only that he needs to raise his paw when said. He could have said “I love peanut butter” in order to get him to raise his paw. He chose something so outrageous so that the dog would be seen as less cute. Fact is, Dank had said from the beginning what his aim was so it is so abundantly clear within the context, that he was mocking Nazism. Even if he did mean to “gas the Jews”, he’s not telling people to do so. He’s not telling his friends followers to do so. It is so ridiculous that he has been convicted and, as a religious Jew myself, I’m outraged that the SCoJeC took it upon themselves to decide that this was offensive to Jews. The Holocaust should not be off limits to comedy or mockery, in the same way that Communist Russia is not off limits (think the Death of Stalin). Video mockery of horrific events is nothing new. Look up the ‘Inquisition’ scene in History of the World Part I. Of course it helped that Mel Brooks is Jewish . . .
One of the most disgusting and hypocritical responses to this issue has come from Graham Linehan. Linehan has supported the conviction despite using similar Nazi jokes in Father Ted. It’s apparently hilarious to make a Catholic priest make a Nazi salute but not a dog. I’m extremely curious to know the origins of the charge. Was it the police service (internally) who viewed the video and charged him or was it an independent person or organisation who laid a complaint with police resulting in the charge. If the complaint was solely driven by the state and the state went and found “witnesses” to testify to their offence then I’m a little baffled. Usually in the instance of hate speech cases you need a driving force in the form of a victim(s) who obviously feels offended or affronted in some manner. Did the state assume that the video would offend a class or group of people and then went looking for these people? Either way I’m baffled at the outcome, a man facing a potential non-custodial sentence for something which is ultimately trivial. But hey we killed Socrates for what amounts to something trivial so I guess “Dankula” got off light. It wouldn’t seem so trivial to you if dogs formed their own Nazi Party. I, for one, don’t want to be ruled by a Nazi dachshund nor live in fear of Gestapo pit bulls. As far as I know there was no complaint from a member of the public. This appears to have come from the police themselves. This suggests they were monitoring Meechan’s YouTube channel looking for something they could prosecute him for. We are looking at a return to pre-Pace Sweeney-style policing where the police could always find something to prosecute ‘bad ‘uns’ if they looked hard enough. Interesting to contrast this over-zealous prosecution of thought-crimes (pardon me – “communication crimes”) with the total lack of any zeal for tackling a soaring rate in violent and exploitative crimes in certain urban areas throughout Britain. Our most reliable news source (TR) reported that the complaint was instigated internally by the police, via some kind of state-employed anti-hate monitor. We re in worse trouble than we know. The authorities are facing completely the wrong way, suppressing dissent while hoping for a peaceful transition. To what? The line they’re holding is so far outside what you’d call British that it’s effectively taking the other side. Tyranny over the minutia of everyday life, anarchy over the important stuff. Dogs can instinctively raise a front leg and bow their head as a sign of submission. While we’re on the subject, imagine two people doing a high five but standing apart, or in one instance doing it with me refusing to participate. It’s just a similar case as in The Joke by Milan Kundera… It is at once ridiculous and funny and worrying – and more worrying since the same process seems to be spreading in many western countries. (Sorry for not being a good english speaker). This spectacle should be thought of as a reasonably effective head fake. The technocratic class in the UK is complicit in the rise of true anti Semitism both by turning a blind eye towards the behavior of Muslims and by inciting sublimated neo Marxist class war narratives that never turn out well for the Jews. Prosecuting a third rate comedian allows the petty authoritarians to tout their virtue and avoid scrutiny of their true priorities which do not include addressing real causes of anti Semitism in a meaningful way at all. I, for one, welcome our future Dachsund-run ethnostate. No, it isn’t, and popular advocacy of free speech does not always need to be delivered with a virtue-signaling stab in the back. The reason why the video became popular is that it was effective comedy. It delivered a solid laugh to millions. Effective comedy is a threat to authoritarian ideologues, that’s why it was penalized, and that is a central reason it needs to be protected in a free and fair democracy.